Engineering, Prototyping, Production Runs and More. We do custom metal solutions. Our technical sales team, mechanical designers, and machine operators excel at helping you produce your sheet metal, structural/architectural metal work, machine refurbishing, or prototyping project. Whether it is a simple component or complex automated machine, our precision metal fabrication and design services are capable of taking your project from idea to reality. Using industry standard software (AutoDesk, SolidWorks, CAD) and equipment, we’ll produce solid models, a complete drawing package (model form or “in the flat”), proof of concept pieces, or your finished product. 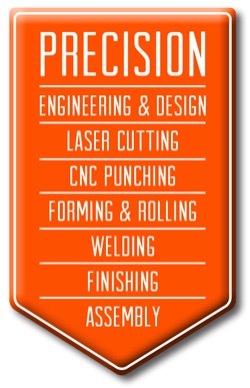 Our team has over a century of experience in Engineering & Design, Laser Cutting, CNC Punching, Forming & Rolling, Welding, Finishing, Assembly and more. Let us know how our team can assist you. Need metal work for an artistic Architectural & Structural project?